At noon, the hot climate was sapping everyone’s energy. Anxiety that was building against humid surrounding suddenly evaporated and gave way to a thriving festive environment as flock of joyful guests made their entry to the reception hall. Smiling faces and friendly exchanges permeated the glorious gathering. By a graceful timing, I encountered a lady. 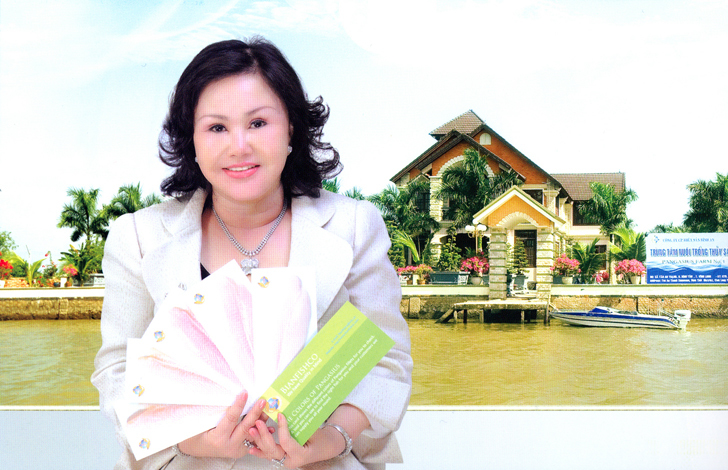 She’s known as a successful entrepreneur from the Song Hau River. Her appearance – with selective clothing and jewelry – while emanating classy luxury, hardly concealed something rustic inside her innermost: her countryside-accented voice stirred up in my mind a nostalgic feeling: all of us grew up from a nurturing river, that’s The Native Vietnamese River echoing the familiar motherly lullaby deeply dear to each of us, or a sentimental river in Southern delta region. Her presentation revealed with humble sincerity her fascinating rags-to-riches journey that compelled my curiosity: Dieu Hien, the lady proprietor of Can Tho –based Binh An Fish Company employing 5,000 employees embraced an ambitious goal of bringing stable living to the destitute inhabitants in Western region of South Vietnam. She herself suffered a humble childhood being an orphan living under the loving care of her aunt. Step by step, and wadding through various forms of endeavors she managed to stand on her feet to earn a living, and in the process steel up and enlighten up her upwardly will. From challenging adversity, she managed to make a successful landing onto business circle, and then being empathetic to and sharing her success with many people. As time goes, she became more prosperous. Unison of mind and heart form the marching tempo of her company as each and everyone contributed to the glorious success of Binh An Fish Company. The more challenging and bigger target was Binh An Fish Company’s expansion to the USA. She envisioned that her company product – bass fish - will be embraced by American as their daily consumption. The slogan “Yes We Can! We Do Quality” that she learned from President Obama served as her commitment to advance further in expanding market share and offices in USA. Sharing that same spirit, a grandson of the Beverly Hills’ founder talked with pride to me: “Beverly Hills is not a city that embodies affluence, rather the IQ and achievement of people. We welcomed Binh An Fish Company in that context, and yet her reply to us was just a nod! From her single word”Yes,” we anticipate Binh An Fish Company’s success and enhancement to our city’s reputation. On the way back to San Jose, the success by the Lady from The Song Hau River lingered on the mind of my associates and my own. It’s difficult to be successful in one’s native country; it’s much more difficult and challenging to integrate into American market. I however understand and can relate to the enduring efforts of a woman trying to advance with empty hand, zero resources except for her own belief and compassion which brought about her success today.